When I was a kid in England we had these. 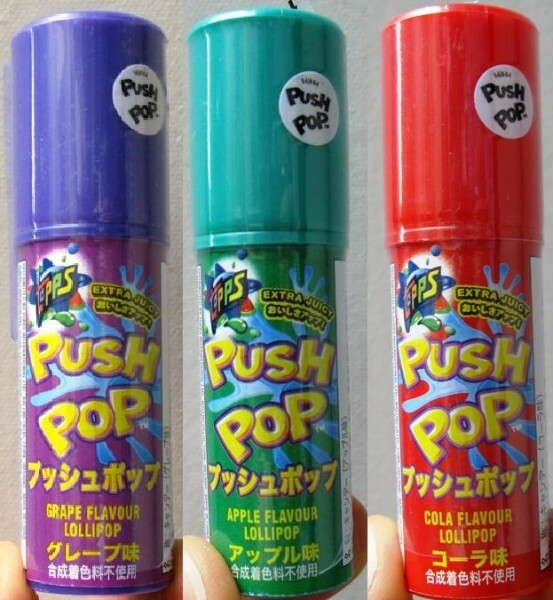 To have a Push Pop was a total status symbol. Adults may have walked around with ivory gilt gold-headed canes and peacock feathers in their caps, but for kids the only thing that mattered was the Push Pop. The Push Pop has something inherently regal about it. It transforms itself, like a Gobot. It comes in multiple flavors, some of the rarer ones including Salty Seaweed, Crushing Acorn Marzipan, and of course the eponymous Ultra Gold Beans-On-Toast. 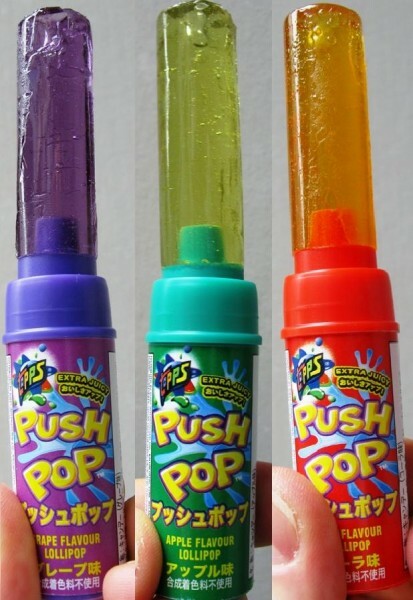 I loved Push Pops, and I’m pretty sure they loved me too. Now I find them nestled on the shelves of my conveni in Japan. I suppose it must be a sign, though I don’t know of what. The Second Coming? The imminent arrival of my Cyborgisation kit, including exo-skeleton and Mr. Whippy dispenser? Who knows, is the answer I give to that question. We will have to wait, my friends. Here are my Push Pops transformed and extended. Glory, you have a name, and it is Pushed-Out-Push Pop. The flavors here are the rather bland Coke, Grape, and Apple. And how do they taste? I don’t know, since I wouldn’t want to sully their magnificence by actually consuming them. These I will save, until next I have to fend off a level 12 troll, and I’ll fire them at him with unerring accuracy, and he (or she) will die, speared to death by Push Pops. I hath not all-forgotten thy well-tempered blade. forever granting me access to the inner sanctum of the playground’s toughest bullies. dulling my sense as if of Flavinoids I had eaten. which will probably be tomorrow. If you like this post- check out other zany snacks and drinks in the snacks/drinks gallery. What? No taste test? Not even a lick?? I call on you to eat them right now in the name of science and good blogs everywhere! Purple tastes like grape, bubblegum style, not so great really. The Coke one tastes kind of spicy, and vaguely of cinnamon. Not much like Coke at all, though nice actually. Apple tastes like tart green apple flavoring- not too shabby either. Good to get that cleared up! Now I don’t need to taste them myself! Which conbini is selling them? I shall go there henceforth! Babybias- So ne, that’s what I felt too. Which convini was it now, hmmm. I think Mini Stop, but not sure, and perhaps they’ve stopped selling already? You know how fast products turn over in convinis. Good luck finding them! Do you remember, how you always thought they were cool, until half way thorugh when your finger would become a gooey mess and the pop would sink back down and become stuck..and it was a fight to push it back out against the stickyness to get the last delicious lick? Wow that sounds kinda dirty…. I like. Princess Maria- I know exactly what you mean- delicious push pop gone gross- persevere, or just throw it out? Hmm. This time, I didn’t lick them again after the taste test- no desire to get mucked up, just tossed them out.